We mourn the recent passing of Betty (BJ) Maillette, age 92. 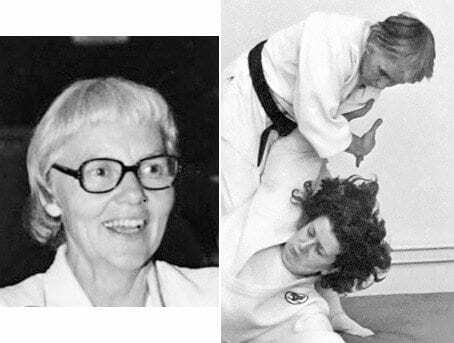 Betty dedicated much of her life to teaching Jujitsu and self-protection to women. She was active in the American Judo and Jujitsu Federation (AJJF), receiving the title of Professor in 1972, and in 1980 attaining the rank of Rokudan, 6th degree Black Belt. She served as president of the Federation and for many years was its highest ranking woman. Betty was born in Tacoma, Washington; her family moved to Oakland when she was a young child, settling on Perkins Street in the Adams Point neighborhood. She was always close to her parents, Clarence and Helen Maillette. During her life, BJ developed many other talents and interests in addition to Jujitsu. She attended San Jose State College as a music major and was often a featured vocal soloist both in high school and in college. She worked in the printing industry for several years, including at the Mare Island Naval Shipyard. She took great pride in being the co-founder and co-owner of Trailhead Wilderness Supply for more than 10 years. She was also an avid reader, a devoted gardener, an enthusiastic genealogist, and a skilled woodworker, and after retirement, she loved the animal population on their country property. BJ always had a strong interest in photography and once hoped to establish this as her career. It was because she was so often out alone at night taking photographs that friends first encouraged her to learn self-defense. In the 1950’s Betty began training with Ray Law in Oakland, and became increasingly committed to Jujitsu. In 1962 she earned her first degree Black Belt and began teaching women’s self-defense at the Oakland YWCA. In 1972 she realized her long-held dream of having her own school, opening “The Dojo,” a school of Jujitsu and self-protection for women, on MacArthur Boulevard near 35th Avenue. Over the years, BJ taught self-protection and Jujitsu to hundreds of women. As a teacher, she was dedicated, confident, vibrant, persistent, exact, and encouraging; she opened doors for us all. Her students were of all ages, sizes, and physical abilities. She shared with us her strong, elegant arts, her enthusiasm, and her joyful spirit, and showed us we could be so much more than we had realized, in Jujitsu and in our lives ahead; she inspired us to each stand tall, be proud, and help one another. BJ retired from teaching in 1980; her Black Belt students continued the school. Since that time, some of BJ’s students – and their students – have opened their own schools, continuing her traditions. Many have remained connected to one other over the decades. Missing her deeply are Carol Lloyd, best friend of over 40 years, her nephew Michael, and other long-term friends including Joyce Blake, Ramona Bell, and Charlene and Michael Fischer. She is also missed by countless others. BJ changed our lives. We will forever be grateful.